​"A​ transnational literary tour-de-force. Readers will be carried along by its creepy charm.​"
"Debut author Clarissa Goenawan spins a dark, encapsulating story that will certainly reel you in completely." ​"Elegantly ​[combines] a suspenseful mystery with an eloquent meditation on love and loss.​"
"Throughout this novel, numerous moments pleasantly evoke the surrealism of Murakami, the nightmarish descriptions of Abe, the alienated youth of Yoshimoto, and the ill-fated lovers of Kawabata. But Rainbirds, suffice it to say, is a different beast, a contemporary work of noir that draws readers into an eerie landscape that is hard to forget." "If you love atmospheric mysteries full of light and mist, dreams and omens, all set in small-town Japan, read Rainbirds." "A thrilling unraveling of a single, complex mystery. Intriguing and unique . . . riveting . . . a spellbinding murder mystery." ​"​In a genre-bending novel about family and loss that shifts from a murder mystery to magical realism, Goenawan infuses her postmodern tale with enough complexity, suspense, and emotional connection to make it memorable and haunting​." "[A] well-paced mystery . . . Goenawan’s debut balances a finely wrought plot with patient, measured portraits of fragile relationships, making for a spare yet inviting novel that grabs hold and doesn’t let go." "Goenawan's debut proves to be a soulful whodunit full of deadpan humor and whimsical narrative unpredictability. A witty, well-constructed debut." "Evocative . . . an intricate, powerful novel." "Goenawan offers a moving investigation of love, loss, and grief." ​"A​ work of deep tenderness and ardent storytelling.​"
"Goenawan’s certainly talented as a writer; the novel’s immensely readable, intensely atmospheric." "A beautiful mystery setup with a complex, magical love story." "A beautiful, well-crafted story, Rainbirds is an exploration of grief, love and loss. Clarissa Goenawan has written a powerful debut novel that will leave readers craving more." "A hauntingly moving story of loss and alienation." 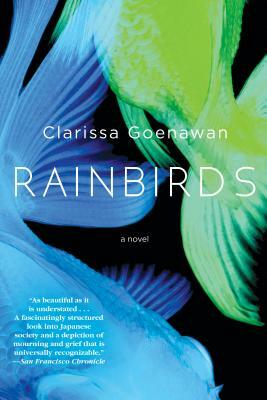 "Rainbirds is a deeply immersive novel: I lost myself in Goenawan's masterful rendering of a sleepy Japanese town."